Melinda's Cottage, No.5 Forest Gardens is a delightful cottage in the quiet village of Bucks Mills within a conservation area on the edge of beautiful Bideford Bay. It provides a good base for exploring Bideford, Barnstaple, Clovelly and Westward-Ho!, and is also close to Hartland Quay, The Tarka Trail etc. Lundy Island can be visited by boat from Bideford. An honest 5 minutes walk from the cottage, the path leads you past the old lime kilns to a pebbly, sandy beach with lovely rock pools and safe swimming. The North Devon Coast Path crosses the village, leading to Clovelly in one direction and through the woods to Peppercombe in the other. Although there isn't a pub in the village, there are several within a few minutes drive of the cottage. Many local attractions and beautiful countryside. Visit RHS Rosemore gardens, Hartland Abbey, Clovelly, Lundy Island, boat from Bideford, The Big Sheep, Atlantic Village shopping centre, swimming etc. We have stayed in many self catering cottages and have tried to provide everything for a super holiday. Available all year. Short breaks (min 2 days) from �85 per night. All prices include electricity and bed linen/towels and the beds will be 'made up' for when you arrive. Our fourth stay and we enjoyed it even more this. Still magic and super weather. Walked to the beach each day. Jasper enjoyed fishing in the rock pools. The bathroom improvements are excellent especially the shower over the bath. We will be back. Beautiful cosy cottage near the beach. This is a wonderful cottage with a warm cosy feel. It was the perfect base to explore the local area, and have cosy nights in with our baby. The bed was very comfy! We particularly enjoyed the gnome reserve and chips on the seafront at Appledore. We had a lovely time and hope to go back next year for a longer stay. Situated in the quiet village of Buck Mills, on the edge of beautiful Bideford Bay, the cottage is just 5 minutes walk from a pebbly, sandy beach with lovely rock pools and safe swimming. The location provides a good base for exploring Bideford, Barnstaple, Clovelly and Westward-Ho!, and is also close to Hartland Quay, The Tarka Trail etc. Lundy Island can be visited by boat from Bideford. The North Devon Coast Path crosses the village, leading to Clovelly in one direction and through the woods to Peppercombe in the other. Although there isn't a pub in the village, there are several within a few minutes drive of the cottage. Golf courses nearby include Royal North Devon, at Westward Ho! (9 miles) which is England's oldest course. If you want to do some shopping Bideford has many very good small shops, Pannier Market, supermarkets and discount outlets at Atlantic Village. Atlantic Village has attractions for children including a pirate ship! 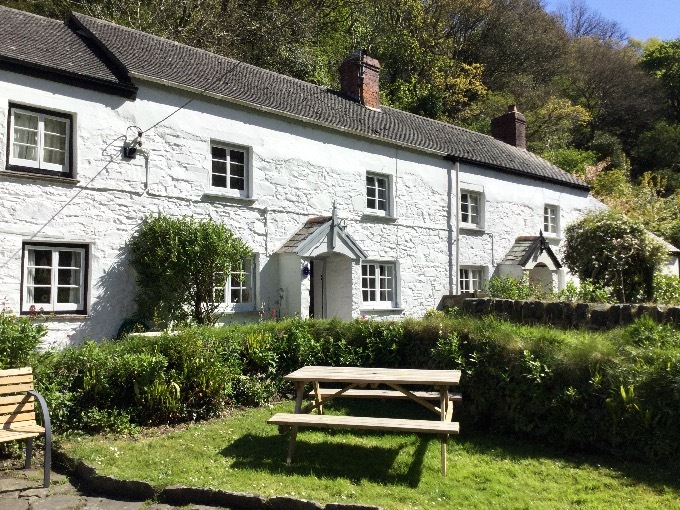 Devon cottage holiday accommodation prices prices per week. We are open all year, short breaks out of season or at short notice at any time - from �85 per night (min 2 nights). We ask for �100 per week deposit on booking and balance 6 weeks before your holiday starts. Pay by cheque, bank transfer or PayPal. Bed linen and towels provided and beds will be made up for when you arrive. No charge for electricity. High chair and travel cot provided if needed. 10% discount for previous visitors. Please note, we're sorry, but we do not allow pets.